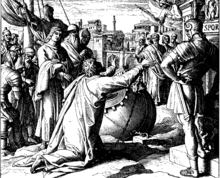 The author of Acts arranges Paul's travels into three separate journeys. The first journey,[Acts 13–14][when?] led initially by Barnabas, took Paul from Antioch to Cyprus then into southern Asia Minor (Anatolia), and finally returning to Antioch. In Cyprus, Paul rebukes and blinds Elymas the magician[Acts 13:8–12] who was criticizing their teachings. A legend later[when?] developed that his martyrdom occurred at the Aquae Salviae, on the Via Laurentina. 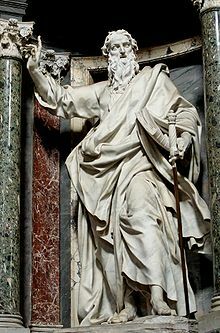 According to this legend, after Paul was decapitated, his severed head rebounded three times, giving rise to a source of water each time that it touched the ground, which is how the place earned the name "San Paolo alle Tre Fontane" ("St Paul at the Three Fountains"). 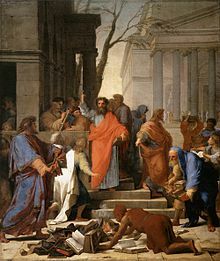 Also according to legend, Paul's body was buried outside the walls of Rome, at the second mile on the Via Ostiensis, on the estate owned by a Christian woman named Lucina. It was here, in the fourth century, that the Emperor Constantine the Great built a first church. Then, between the fourth and fifth centuries it was considerably enlarged by the Emperors Valentinian I, Valentinian II, Theodosius I, and Arcadius. 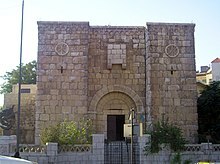 The present-day Basilica of Saint Paul Outside the Walls was built there in 1800. 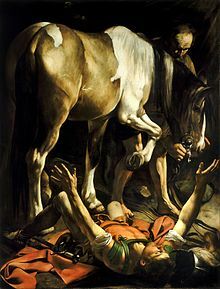 Commenting on this passage, Raymond Brown writes that while it "does not explicitly say" that Paul was martyred in Rome, "such a martyrdom is the most reasonable interpretation".Eusebius of Caesarea, who wrote in the 4th century, states that Paul was beheaded in the reign of the Roman Emperor Nero. This event has been dated either to the year 64, when Rome was devastated by a fire, or a few years later, to 67. According to one tradition, the church of San Paolo alle Tre Fontane marks the place of Paul's execution. A Roman Catholic liturgical solemnity of Peter and Paul, celebrated on June 29, commemorates his martyrdom, and reflects a tradition (preserved by Eusebius) that Peter and Paul were martyred at the same time. 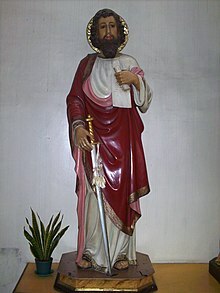 The Roman liturgical calendar for the following day now remembers all Christians martyred in these early persecutions; formerly, June 30 was the feast day for St. Paul. Persons or religious orders with special affinity for St. Paul can still celebrate their patron on June 30. Nicephorus claims that Paul was a little man, crooked, and almost bent like a bow, with a pale countenance, long and wrinkled, and a bald head. 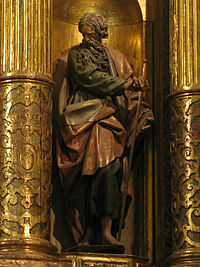 Pseudo-Chrysostom echoes Lucian's height of Paul, referring to him as "the man of three cubits". Paul at one point compares himself as one who is like "a miscarried/aborted child". [not in citation given] This however probably does not suggest some kind of deformity such as being crooked or hunch-backed, that tormented him, but rather his view of his worthiness to become an apostle. 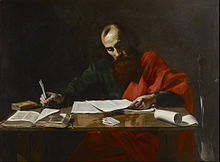 Paul redefined the people of Israel, those he calls the "true Israel" and the "true circumcision" as those who had faith in the heavenly Christ, thus excluding those he called "Israel after the flesh" from his new covenant (Galatians 6:16; Philippians 3:3). He also held the view that the Torah given to Moses was valid "until Christ came," so that even Jews are no longer "under the Torah," nor obligated to follow the commandments or mitzvot as given to Moses (Galatians 3–4). 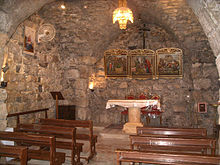 Visit any church service, Roman Catholic, Protestant or Greek Orthodox, and it is the apostle Paul and his ideas that are central – in the hymns, the creeds, the sermons, the invocation and benediction, and of course, the rituals of baptism and the Holy Communion or Mass. 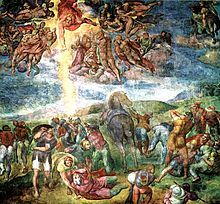 Whether birth, baptism, confirmation, marriage or death, it is predominantly Paul who is evoked to express meaning and significance. ^ Hagner, Donald (1980). Hagner, Donald, ed. Paul in Modern Jewish Thought in Pauline Studies. Exeter: Paternoster Press. pp. 143–65. ^ Langton, Daniel (2011). Westerholm, Stephen, ed. Jewish Readings of Paul in Blackwell Companion to Paul. Blackwell. pp. 55–72. ^ Langton, Daniel (2011). Levine, Amy-Jill, ed. 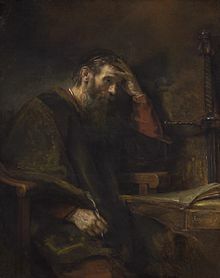 Paul in Jewish Thought in The Jewish Annotated New Testament. Oxford University Press. pp. 585–87. 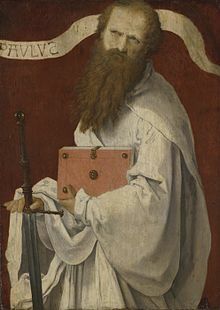 Wikimedia Commons has media related to Paul of Tarsus. Look up Pauline conversion in Wiktionary, the free dictionary.